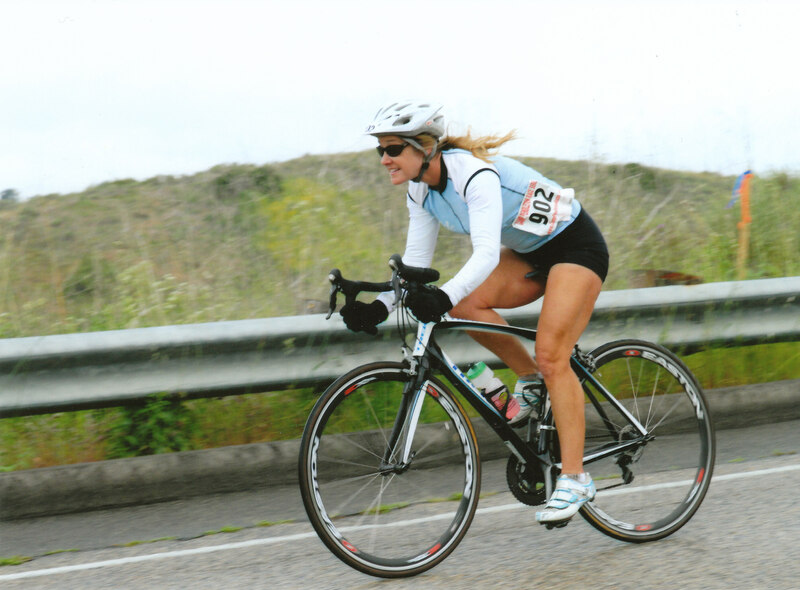 My name is Judy Linscheid and I have been a road cyclist for approximately 8 years now. I first learned to ride a two-wheeler in Kindergarten, after my friend, Ruthie, announced one morning that she had thrown away her training wheels over the weekend. I couldn’t bear the thought that she could do it and I couldn’t (I had been on training wheels for quite some time). Once I got the hang of it, I have never forgotten. As a child I spent a lot of time outside – much of it on a bike. It wasn’t serious sport, just fun. On Sundays, when the corner Atlantic Richfield station (now ARCO) was closed, we turned the place into a track and rode around and around in circles. On other days we pretended to be a motorcycle gang, riding single file and “terrorizing” the neighborhood. Yes, we had fun. In high school, I joined the drill team – not exactly athletic, but when the 80s aerobic dance craze came along, my experience in performing dance routines landed me a job teaching at a gym to earn some extra money in college. To this day, I still think they made a mistake in hiring me, but I’m glad they did. A lot changed in the industry over the years. We started out in tights, leotards and leg warmers, gradually moving away from a “dance” look to a more athletic one. But the important thing was and still is health. I feel blessed to have been a part of the fitness industry because it gave me a healthy lifestyle for myself and also my children. I gave up teaching in 2005 when I began my nursing career. I bought my first bike and was excited to get outside of the gym walls and smell the fresh air for a change. I started out riding with my husband and a few of his friends. I soon learned that the cycling community was comprised of not only recreational riders, but very competitive and serious athletes. Competitive by nature, I found myself pushing very hard to try and keep up with the “fast guys”. I was as fast as some, faster than others, yet probably slower than most. I rode alone many weekdays, but on Saturdays, I always tried to join up with a group. I believe groups are great. You not only get a chance to see how you fare next to others, but you get to meet some awesome friends as well. Here in San Diego, we are in, what I call “cycling paradise.” On Saturdays I feel like a little kid again, out on the rode with others who take time out to play. Aren’t we all just kids at heart? We push ourselves to beat our record (or a friend’s record) on Strava. But at the end of the day, it really is about having fun.